Dam/Sire Briar Rose Belle of the Ball "Belle" Briar Rose Rock-A-Bye Sonny "Sonny"
About AKC Registered Beagle, energetic, Field Champion bloodlines. Great with kids and other animals. Independent nature, always following her nose. Very quiet, only barks when there is something to bark about. 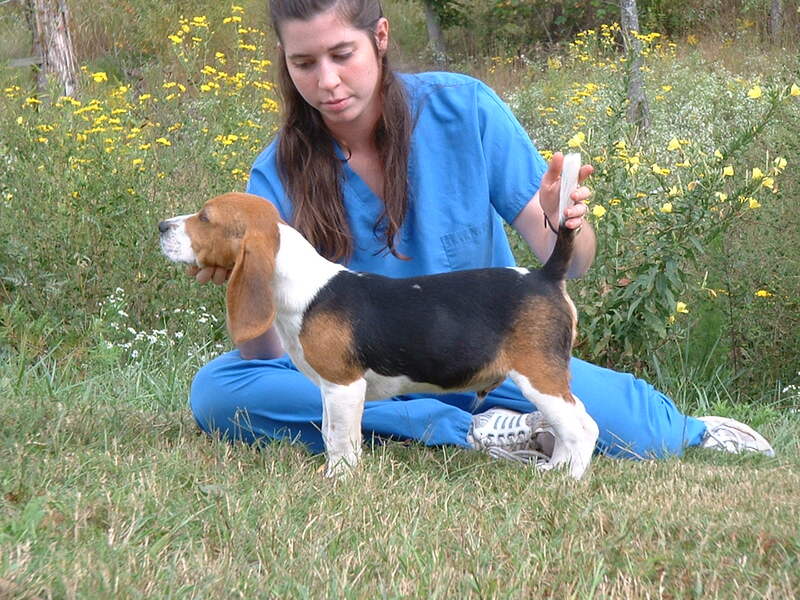 AKC Registered Beagle, sweet and energetic, great with kids and other animals. Great hunter. Slower tracker and stockier than Belle, with a better muzzle. Should help to put some build on the pups and hopefully get some slower trackers. March 09, 2010 Date of Breeding Belle and Sonny were bred, but we didn't get a "tie", she could still get pregnant without it, but the chances are not as good, will try again in a couple days. March 11, 2010 Date of Breeding Belle and Sonny were bred again, not only did we get a couple of long mounts, we got a short tie, chances are really good she will conceive. Check back in 4-5 weeks for confirmation. April 7, 2010 4 weeks post-breeding Belle's tummy is starting to firm up and her teats are enlarging. Officially confirming pregnancy, check back weekly for information. Also keep up to date by visiting us on Facebook. April 14, 2010 5 weeks post-breeding With pregnancy confirmed, Belle has been switched to Puppy food. Should be able to feel them moving in the next 1-2 weeks. April 20, 2010 6 weeks post-breeding Belle is beginning to be less active and I can now feel individual puppies. I count around 4 now, over the next week when they start moving, I will be able to get a better idea. I can feel teeny tiny puppy movements now, and they will only get stronger over the next two weeks. Next week I will begin to take her temperature so that I know when she's about to go into labor. Her normal temperature is between 101.5-102.5, and when it falls below 98.4 and stays there, she will whelp within 12-24 hrs. May 05, 2010 8 weeks post-breeding I have begun to take her temperature twice a day to watch for the drop. May 12, 2010 64 days post first breeding Her temperature at 7am was 98, at 8:30 it was still 98.2, We have a drop! Pups expected within 24 hours.